Today was the Bethlehem Halloween parade. My son marched in the parade, and my husband drove the support van for the band. Logistically, this required that my husband drop our daughter and me off downtown to amuse ourselves until the parade started. Then we got to downtown, where as I said, we had to amuse ourselves. Given that the Moravian Book Shop (the world’s oldest bookstore) is there, this was not hard. We looked at books, ate lunch at the cafe, and bought her a small coloring book to amuse her while we waited outside. Then we went out and found a tiny unclaimed wedge of sidewalk in front of a pair of parking meters, and the girl settled in to color her ballerinas. I pulled out a notebook and pen and started writing about the discovery of a dead body at a parade. I’m sure it’s just as well that the people around me didn’t know I was sizing them up as potential victims and suspects. All in all, not a bad afternoon. 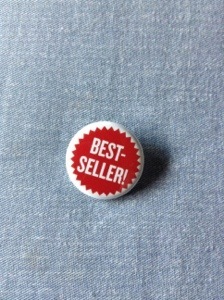 Few hours of fun with my daughter, a couple of new story ideas, and a pin to remind me of one of my down-the-road goals. How’s your Sunday afternoon been? Otherwise known as, why quit when you’re behind? No, really. If you haven’t reached your goal yet, and you quit, you’ll never reach it. Perseverance is the art of creating a goal and focusing on it — either on the long-term goal or on each step you need to take along the way — until you’ve reached it. Sometimes, the goal is something like making it through another week. Sometimes, it’s writing a novel. Sometimes, it’s running a race, learning a new language, or raising a child. Perseverance gets us through. Take it one day at a time, one step at a time — in my case, literally. Perseverance helped me relearn to walk, more than once. Perseverance is helping me relearn to run. Perseverance keeps me going. What have you persevered at recently?